Point Robinson lighthouse has been closed to tours since August, stemming from an accident that took place inside (Paul Rowley/Staff Photo). The lighthouse at Point Robinson Park has guided ships and welcomed sightseers from its perch overlooking Puget Sound since 1885, but it has been closed to tours since last July after an accident occurred inside the tower during the annual Low Tide Festival. 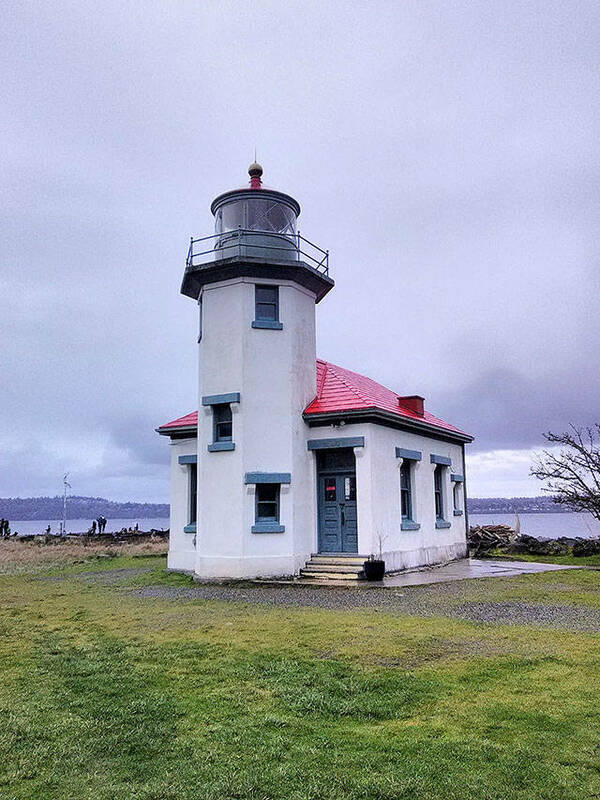 Now the U.S. Coast Guard, which leases part of the marine conservancy to the Vashon Park District, wants assurance that the lighthouse is safe for the public to enter before tours can be reinstated and the current five-year lease renewed. That lease is set to expire in July. According to park district Executive Director Elaine Ott-Rocheford, tours in the lighthouse may be permitted after commissioners submit documentation to the Coast Guard of measures they will implement to prevent future accidents at the property. Restoring public access to the lighthouse will depend on an assessment of current procedures and protocols there as the park district considers making a range of improvements to the facility, which could take months. In last summer’s accident, Ott-Rocheford said a woman fell on the stairs while climbing the lighthouse tower on a guided tour. Her fall was not witnessed by those accompanying her, and Ott- Rocheford was unable to provide other details. The woman was unconscious when first responders arrived and later died from her injuries. Following the incident, several board members put together a number of potential alterations the district could make to the building. They suggested replacing the non-slip pads on the tower steps and adding hands holds at the top of the stairwell, as well as raising the heights of railings in the lantern room and around the gallery deck. Ott-Rocheford estimated that altogether, most of the improvements would cost the district roughly $2,500 should labor come from the maintenance staff. But the cost for materials and work on the railings, she noted, could run as high as $10,000. What’s more, any changes commissioners approve will first have to be vetted by the Coast Guard and Washington Department of Archaeology & Historic Preservation (WDAHP). In a phone conversation, Ott-Rocheford acknowledged the mandate stipulating that changes to the lighthouse must reflect the character and design intention of the original structure per WDAHP in accordance with the National Historic Preservation Act. She said that whatever the district will do must align as closely to the look and feel of the past as it can manage. She does not believe the process will be contentious. In 2015, the lighthouse’s cedar shake roof was replaced with a durable red metal one after a recommendation by the Coast Guard. It was meant to look traditional, yet be able to withstand decades of corrosion from the salt air and the sea. Lighthouses of the era did not have metal roofs, said Ott-Rocheford, but in that case, the replacement was agreed upon by all parties. Last summer’s accident, however, may not result in as neat of an outcome for the district — its insurance provider has recommended all patrons sign a liability waiver prior to going on a tour, minding their own risk as posted on warning signs the district would erect outside. Ott-Rocheford also said the district may impose a condition that only two patrons at a time be allowed on a tour, plus their guide, who would lock the door on the ground level behind them. The extra precaution would ensure that staff would know who is in the building at all times, and where they are. In 2004, the Point Robinson lighthouse and keeper’s quarters were added to the National Register of Historic Places, a designation attributed to its intactness and rarity as an example of a Pacific Northwest light station, according to the nomination papers. Nicholas Vann, a historical architect at WDAHP, is part of a team that directs property maintenance and renovations at historic lighthouses and keepers quarters throughout the state of Washington, including the island’s. “A lot of people have memories of interacting with [lighthouses] as landmarks,” said Vann, adding that for many communities they serve as tourist magnates, have considerable local pride invested in them, and often inspire people to support their preservation in a multitude of different capacities. Vann said it is WDAHP’s mission to balance the impacts of contemporizing historical landmarks while preserving their authenticity, but ultimately, eliminating hazards outweighs principle. “Every project is totally different. It’s generally being cognizant of the historic features of the site on an individual basis and trying to integrate whatever interventions you’re doing to it in a sympathetic way,” he said. Capt. Joe Wubbold, president of the Keepers of Point Robinson, said he is pleased by the willingness of each agency involved to collaborate in the interest of opening the lighthouse for tours once again. As a longtime tour guide, he added that he is confident their efforts will make for a better experience than before. To John Spafford, a fourth-grade teacher for the Bethel School District, the captain is one of Point Robinson’s best attractions. “Captain Joe is a hoot,” he said, stating he believes there is no one better to regale his students with stories of his career as a ship commander. An avid traveler, Spafford said he was enamored with the park and lighthouse, writing an enthusiastic review of Point Robinson on Facebook. He said he hoped to organize a class field trip to the marine park but was unaware of the reason why the lighthouse was closed. The logistics of organizing any field trip, said Spafford, did not dissuade him, including one to Point Robinson — corralling 10-year-olds onto a bus, driving onto the ferry — but from his own experience touring the lighthouse before it was closed, he said some aspects of the building made him feel apprehensive about bringing children there. Kitty English, a Keeper of Point Robinson and manager of the Ship’s Store, said the closure has had a demoralizing effect on many of the park’s visitors. English said she is looking forward to the park district’s upcoming annual Kite Day at Point Robinson, scheduled this year for May 11, after which she will take the helm again in the Ship’s Store for the season. With the beaches, picnic area and panoramic view of the sound, English believes there will be enough for those attending the event to enjoy. This version of the story clarifies the reinstatement of lighthouse tours, which is entirely subject to the Coast Guard’s approval.